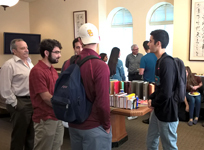 This event was well received by faculty and Persian students and there were more attendees than the first event. MS. Amin was our special guest who recited a poetry from the contemporary Persian poet Homa Mirafshar and sang two songs from the late Iranian singer Marziyeh. Students followed the poetry on their handouts while she was reciting it. The event featured the delicious "Ashe Reshteh" (Persian noodle soup) and tea with assorted Persian cookies. Persian learners were siting among Iranian native-speakers chatting with them. Persian Student Organization hosted a Noruz celebration on March 21, 2017. Students and faculty enjoyed a Persian dinner and sweets while hearing about the holiday in Persian and watching a dance performance. This is a personal web page, containing temporary links to Iranian-related cultural event photos and videos. Please report any broken link.